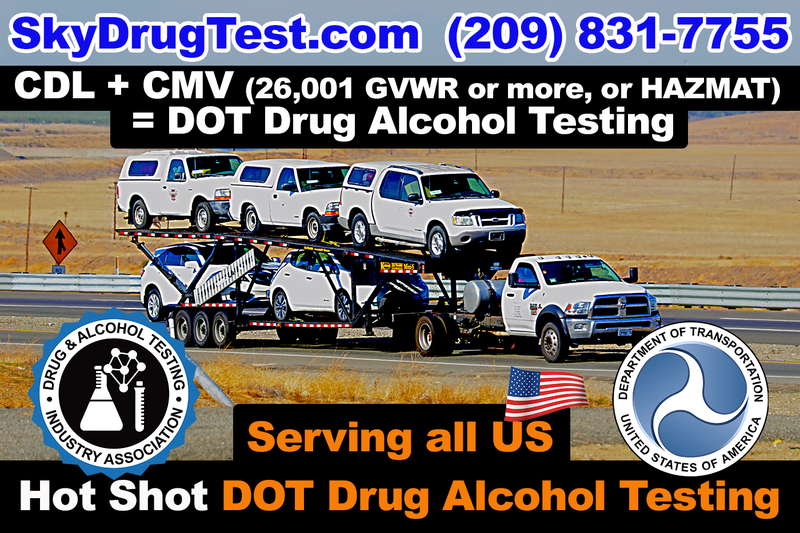 Hotshot Truckers need DOT Drug and Alcohol testing to stay legal on the road if their GVWR is 26,000 or over (or has HAZMAT placards). This is because the Federal Motor Carrier Safety Administration (FMCSA) states that: holders of a commercial driver’s license (CDL) who operate a commercial motor vehicle(s) are required to take a drug test by the Department of Transportation (DOT). The key thing is to remember there are several times and types of DOT drug and alcohol test are required. Pre-employment. Also, before you start your CDL/CMV job responsibilities or other DOT safety sensitive positions. Reasonable suspicion/cause. If a trained supervisor reasonably believes (evidence must be based upon direct observation) . Or there is suspicion that you are under the influence of drugs or alcohol. Plus, this must be based on observations concerning appearance, behavior, speech, smell, etc. Random testing. Sometimes random tests must use a truly random selection process. Each employee must have an equal chance to be selected and tested, but these are completed quarterly, but a random schedule is the DOT preferred method. Return-to-duty testing. This is required after a violation of drug and alcohol rules. You cannot return to any DOT job before being tested and may be subject to unannounced testing for at least 6 times in the first 12 months. These tests must be conducted under direct observation. Follow-up testing. This takes place after return-to-duty. A Substance Abuse Professional (SAP) manages the follow-up testing for up to 5 years, determining how many times an employee is tested, and for what substance. These tests are completed in addition to other DOT required testing. Post-accident testing. This is required if you are involved in an accident meeting certain DOT criteria. An alcohol test must occur within 8 hours of the accident, and a drug test within 32 hours.